Studio lighting, both flash and continuous, tends to be larger with separate power sources, it’s less portable and, often, it’s more expensive. These power packs and strobe units pay off in power, however, allowing photographers to shoot at virtually any ƒ-stop with fast recycling times and no fear of draining their batteries. 1. One light in front of the person camera-left and one in front of the person camera-right, both with an umbrella or a softbox, with the third light hitting the background with a grid over the head to create a hot spot behind the person. The ratios on the front lights can be symmetrical to create flat beauty lighting or asymmetrical to introduce some more drama. 2. One light above and to the left or right in front of the person to create some shadow, with two lights bouncing into umbrellas or two pieces of 4×8 foot foamcore taped together to form a V to illuminate the background. I usually have the backlights at one stop more powerful than the front key light. 3. One light above and to the left or right front of the person to create some shadow on the opposite side of the person, the second light hitting the background and the third as a hair or rim light, depending on the desired results. While the variations are almost limitless, professional photographers tend to gravitate toward certain setups that give them a certain look or style. Companies such as Westcott, Photek, Photoflex and Impact, as well as the major strobe manufacturers, have a wide array of light-shaping products. A basic studio should have a couple of umbrellas, softboxes, beauty dishes and grids to create the envisioned look of the final product. Grids are a great way to create drama. These honeycombed light modifiers come in a number of degrees. The smaller the number, the more concentrated the light. White or silver reflectors and foamcore can also be at the ready for both bouncing in fill light or blocking the light from hitting the lens when a subject is backlit. In a professional studio, flags held in place by a C-stand are used for this purpose. Sandbags are a must for any light stand or backdrop to ensure a safe shoot. A roll of gaffer’s tape, A-clamps, gels and a flash light meter are studio basics. It’s also a very good idea, especially when working with several strobes plugged into one pack, to have a head extension to give the often-crucial added distance for light placement. In addition to shaping the light, we need to pay attention to the Kelvin color temperatures. Profoto makes a number of gel kits that contain colors to balance your color, such as the OCF Color Correction Gel Pack, which includes 20 color gels in orange, blue and green for balancing flash light with sunlight, moonlight and fluorescent light. It also sells an OCF Color Effects Gel Pack that includes 20 gels in Rose Pink, Gold Amber, Light Lavender, Just Blue, Deep Straw, Chrome Orange, Scarlet, Peacock Blue, Magenta and Yellow for experimenting to create mood lighting. One of the advantages of digital is that we can quickly take a test photo and make adjustments. Professional studio shoots are often done with cameras tethered directly to a computer, bypassing the need to shoot to a CF or SD card. These days, I work with three Profoto Acute 2R 1200 power packs and five heads and rent more when needed. Multivoltage power packs are the key when I take the studio on the road for international assignments, which often requires a change in settings to the local current. Since I’m based in the U.S., my packs are set for 120V/60 Hz. Many of the locations outside of North America use 220-240V at 50 Hz. To adjust for this, there are two switches on my Acute 2R packs that need to be set to the correct power. When working in 220-240V locations, the modeling lights have to be swapped out. Each unit’s built-in radio receiver gives me remote operation with my PocketWizard Plus III transceiver. PocketWizards have become the industry standard remote triggers since they came on the market in the late 1990s. In addition to Profoto, companies such as Balcar, Bowens, broncolor, Dynalite, Elinchrom, Norman and Speedotron make high-quality products that are variations of the same theme. 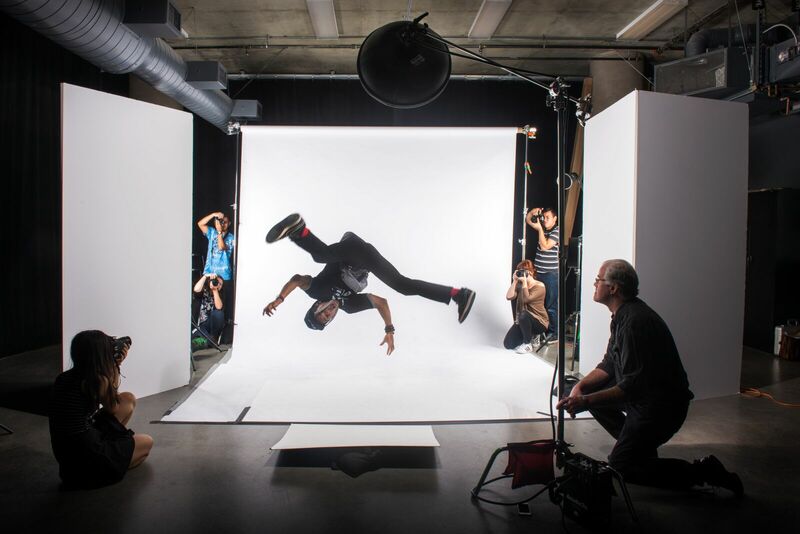 Elinchrom makes many high-end strobe options used by some of the top commercial photographers working today, but it also has a line of monolights that give those with a tighter budget the ability to enter this high-end arena. 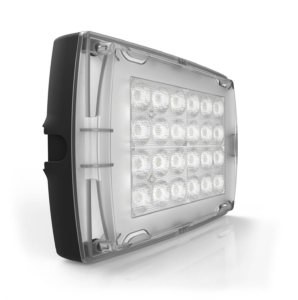 Its D-Lite monolights come in 100w/s, 200w/s and 400w/s varieties and come with a built-in Skyport wireless receiver. They have a five-stop variability in tenth-stop increments. Smith-Victor, a name associated for years with well-made, no-nonsense lighting and affordable lighting equipment, has among its offerings the Flashlite FLC200 and FLC300. These basic monolights put out a maximum of 200w/s and 300w/s, respectively. Another especially affordable option is the Flashpoint Budget studio monolight, which is available in 120w/s, 160w/s and 300w/s versions. These aluminum-housed strobes leave the least dent in the wallet when trying to create a basic studio setup. Whichever brand you use, make sure your camera is set to a shutter speed that will synchronize with your strobe. That’s often a maximum of 1/250th of a second for most 35mm cameras. With the ability to shoot HD video using hybrid cameras has come the need to have small, continuous light sources. Lightweight and compact LED lighting, such as those made by ikan, Litepanels and Lowel, have dimmers to vary output. The same attention to color balance must be taken into consideration with these artificial light sources as when working with strobes. These LED lights can also be used for still photography, of course, when the combination of fast shutter speeds, small apertures and low ISOs isn’t needed. Among the high-end selections is Litepanels Astra 6X Bi-Color LED Panel, which gives photographers the ability to dial in just the right tungsten or daylight Kelvin temperature as well as providing them with a powerful 588 fc/6330 lux at 5.0 feet at 5600K. 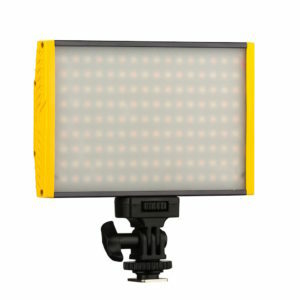 More economical LED lights that can be used effectively for smaller continuous light studio applications include Litepanels MicroPro, which runs off six AA batteries and has twice the illumination of the Litepanels Micro, as well as ikan’s iLED 150. With its built-in battery mount and small size putting out 60 lux, it’s especially impressive when taking into consideration its compact size of 6×3.25×1.375 inches, and it weighs less than a pound. Powered by AC or by battery, the Lowel Blender with a 4x3x3-inch lamp head is another option. It has two sets of LEDs in tungsten and daylight color in one unit, which can be blended to match mixed light sources with dimmer controls on the back of the unit. The Lowel Blender comes with a set of front diffusers for softening light output. The Westcott Skylux emits a constant 5600K daylight-balanced output and quickly mounts to any traditional modifier. It’s often more economical to buy a studio in a kit, such as the Dracast LED500 S-Series Bi-Color LED 3-Light Kit, which includes three LED500 Bi-Color Lights with Barndoors, three diffusers, three soft cases, three light stands and three power supplies. The Genaray SpectroLED Essential 360 Bi-Color LED 2-Light Kit comes with two SpectroLED 360 Bi-Color Panels, two 8-foot light stands and two NP-F770 battery adapters for V-mounts. The economical Savage Cobra Interview LED Light Kit includes three Luminous Pro LED Video Lights, a Multi-Light Connector and three 7-foot light stands. For both flash and continuous light sources, it’s best to set the camera to a specific Kelvin temperature rather than automatic and having to make major color corrections in post. When using strobes or daylight-balanced LED lights, setting your color temperature to 5600K or to the symbol of the sun or the lightning bolt (which represents a flash) will get you close to the correct white balance. When using tungsten-balanced LEDs and other continuous lights sources, a light bulb symbolizes the tungsten mode. Setting your camera to 3200K will also work. Processing software, such as Adobe Lightroom and Adobe Photoshop, has sliders with Kelvin temperatures to fine-tune color. To take full advantage of color correction options and for a myriad of other reasons, shoot in RAW. Remember the two most important degrees on the Kelvin color temperature scale when it’s applied to photography are 5600K for daylight and 3200K for tungsten. If you keep these numbers in mind and comprehend what they stand for, chances are you can get close to a good color balance on your first effort. 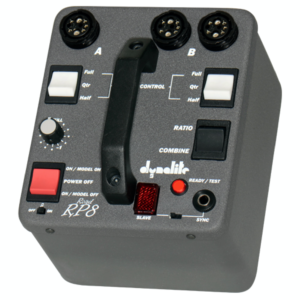 Weighing in at 5.3 pounds, the Dynalite RP800 800W/s Road Power Pack is powerful and versatile enough to handle a wide variety of studio and location work. Two full/half/quarter power switches provide seven basic power settings. The pack has three head outlets and breaks down its output symmetrically or asymmetrically over a 6-stop range and can recycle at a fast 1.2 seconds at full power. Triggering options include a 16-foot Phono to PC sync cord (provided) and an IR or optical slave. The RP800 is compatible with most radio remote systems. A switch lets the user toggle between symmetrical and asymmetrical routing of the A and B flash head outlet banks. 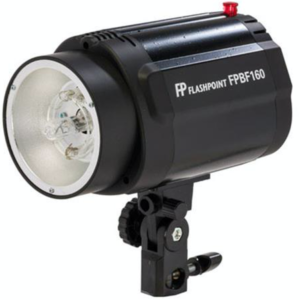 The Flashpoint Budget studio monolight, which is available in 120w/s, 160w/s and 300w/s versions, can fire at 1/8, 1/4, 1/2 and full-flash intensities with a recycle time of 4 to 6 seconds. The 2-pound strobe emits a 5600° Kelvin color temperature flash triggered by its 12-foot sync cable, firing another flash via a built-in photo slave, or with the Flashpoint 8 Channel Radio Remote Control Set. Quality comes at an affordable price with the Onyx 15W and 30W bi-color LED lights, equivalent to 100 and 250 watts of incandescent light, respectively. Housed in a durable aluminum frame, the oncamera lights are adjustable from 3200K-5600K. Both units weigh under a pound and come with a variety of accessories; they use Sony L Series batteries. Litepanels MicroPro runs off six AA batteries and has twice the illumination of the Litepanels Micro. The 5.5x4x1.5-inch LED light has a daylight output of 5600K and comes with a 3200K Daylight-to-Tungsten conversion gel, as well as slip-in 1/4 CTO (Color Temperature Orange) and White Diffusion filter. It comes with a lightweight background stand and a compact wheel case. 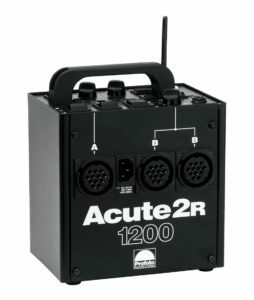 The Profoto Acute 2R 1200 gives 1200w/s of power, weighs 9 pounds and has three sockets for flash heads. The symmetrical-asymmetric energy distribution over six ƒ-stops in 1/4-step adjustments lets photographers fine-tune power between the A and B channels. The unit’s built-in radio receiver allows for remote operation up to just over 300 feet with PocketWizards. Westcott has a package to give the photographer a complete studio lighting system at an economical price. 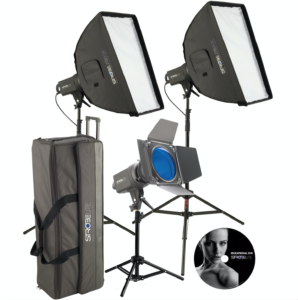 Its Strobelite Plus 3-Light Softbox Kit provides 1200 total watt/seconds of power and works off of 110/120V AC power. Light-shaping tools include two 32-inch softboxes with speed rings, a barndoor set with grid and gels, and two heavy-duty light stands.